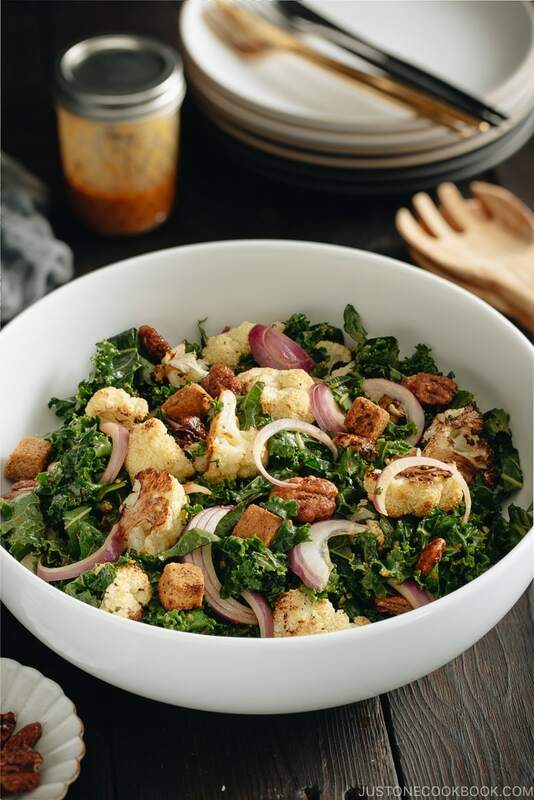 Dressed with creamy and savory miso tahini dressing, this Roasted Cauliflower Kale Salad is packed with delicious caramelized cauliflower, kale, sweet glazed pecans, and crunchy croutons. It’s nutritious and filling. A welcome addition to the holiday table. Every once in a while I like to do some reset by breaking away from rich, carb-loaded foods, especially during the holiday eating mode. This is when I turn to my favorite healthy foods like roasted vegetables. 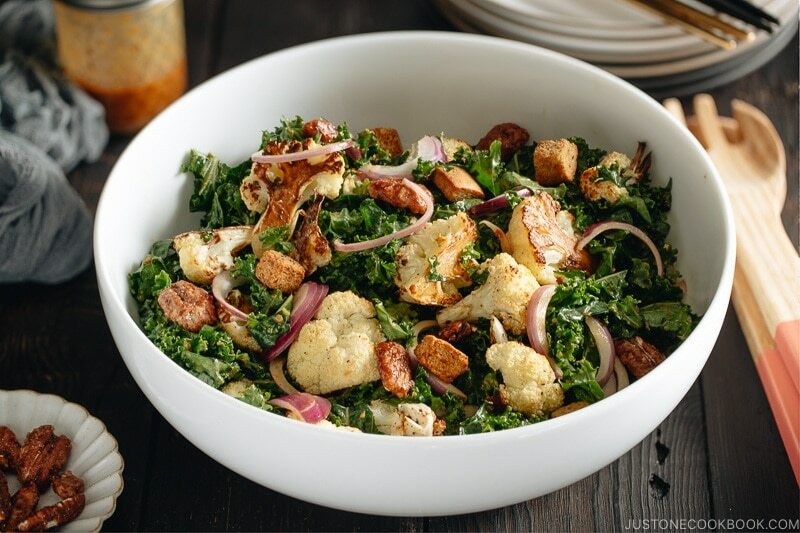 This Roasted Cauliflower Kale Salad with Miso Tahini Dressing is packed with flavors and nutrients, and it’s festive enough to enjoy throughout the season. 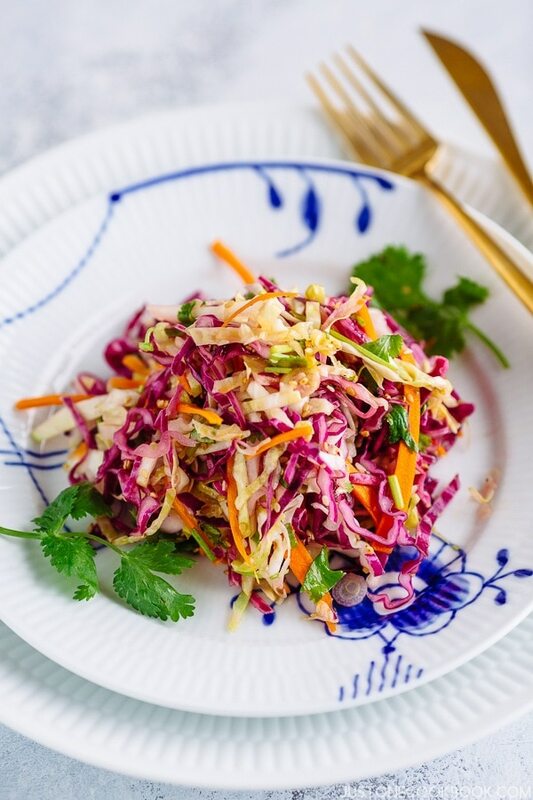 Cauliflower is the main star of this salad. Roasting gives such a nice char flavor to the trendy cruciferous vegetable and it adds complexity to the salad. Don’t forget that there is more than just the white cauliflower too – you can get romanesco, green, and even purple variety! Roast florets of cauliflower, which are tossed in olive oil, salt, and pepper, in 450°F oven for 20 minutes, or until stems are tender and florets are browned and caramelized on the edges. You can use your favorite type of kale for the salad, but I used curly kale. It’s probably the most common type found at the grocery store. It’s pale to deep green with large, frilly-edged leaves and long stems. Grab a big bunch to use it in the salad, soup, or smoothie. 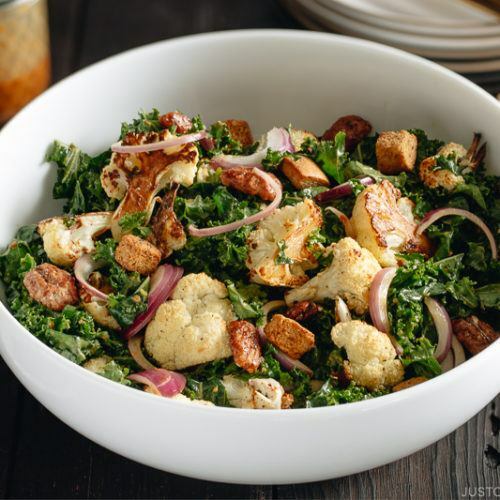 Instead of using lettuce or other leafy green, I much prefer to use kale in this salad because we can dress the kale with miso tahini dressing ahead of time and it won’t be wilted or soggy. This dressing is creamy but rather “heavy” in weight, so regular lettuce or leafy green may not withstand the dressing. Kale, on the other hand, is sturdy enough to hold up the dressing. 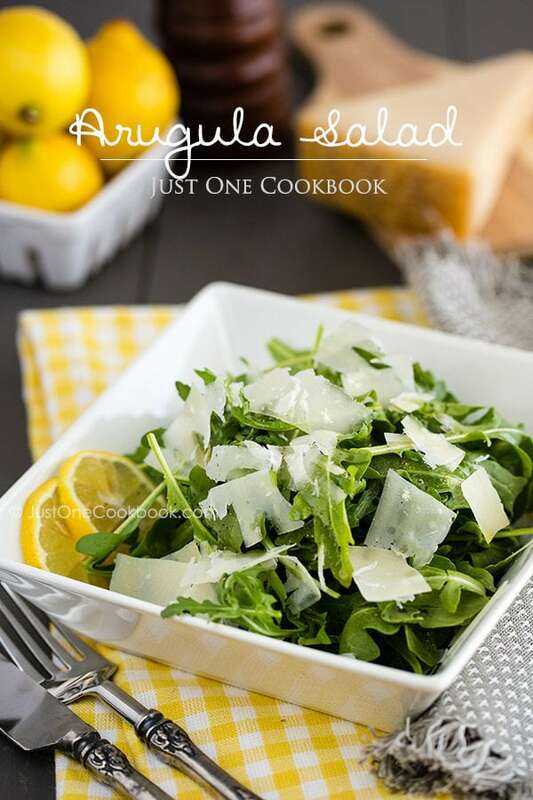 If you decide to use regular leafy greens, keep the dressing on the side and pour in when you’re ready to eat. These are additions, so you can be flexible with what you have on hand. 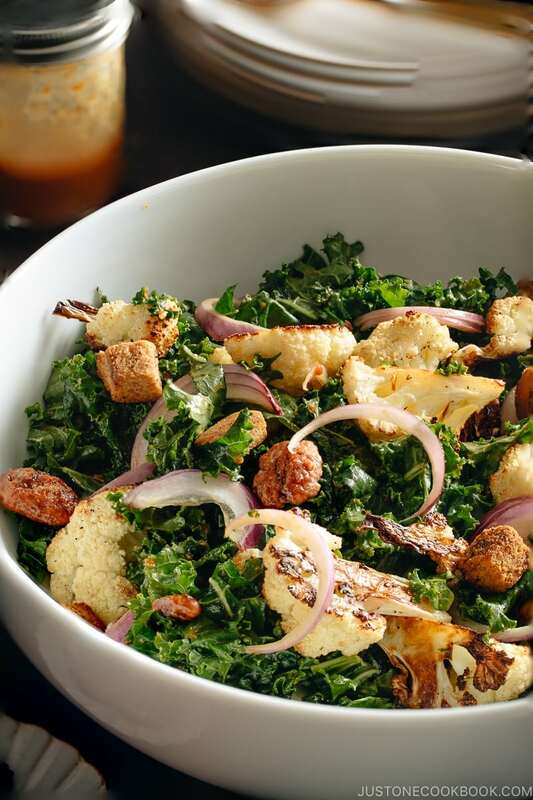 I add red onion for color and freshness, croutons for crisp texture, and glazed pecans for crunch and a bit of sweetness. The idea is to create textures and layers to the salad. For the dressing, I used my favorite All-Purpose Miso Sauce as the base flavor and combine it with tahini sauce. 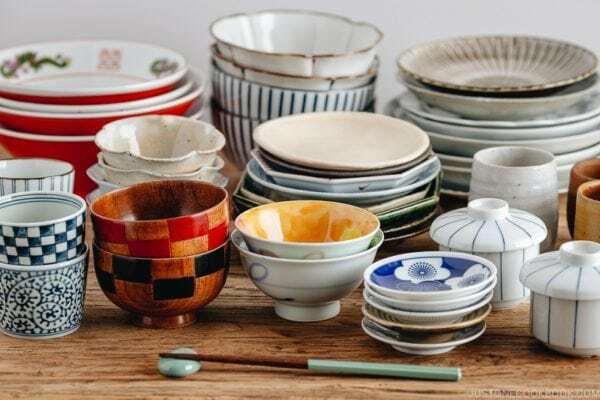 You can use nerigoma (Japanese sesame paste) if you have one in your pantry. But nerigoma can be challenging to find, so tahini sauce makes a great stand-in. With this pairing, you can expect umami and sweetness from the miso sauce, and creamy nuttiness from tahini. I also added in rice vinegar for a bit of zing. You can use lemon juice, but I like to use rice vinegar as it is milder. 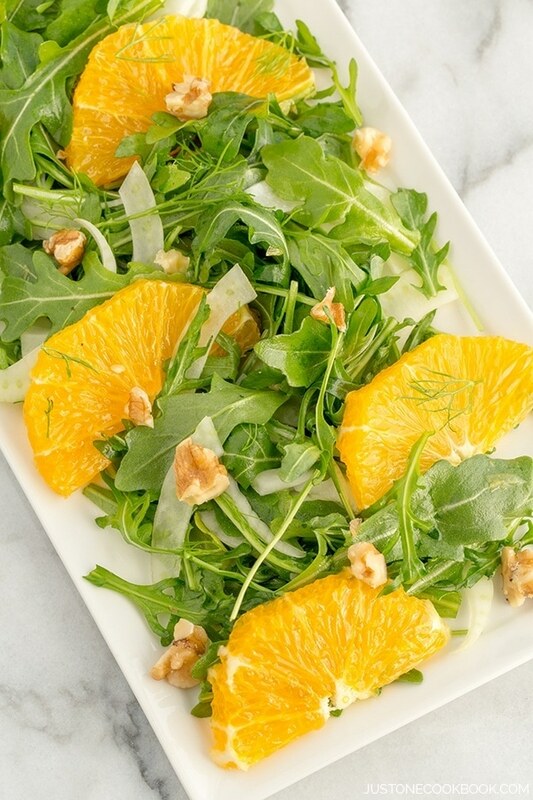 This dressing is also great to prepare ahead. As we do not include any water, it would be good in the fridge for a week. Put the mixture in a mason jar and give it a good shake before use. 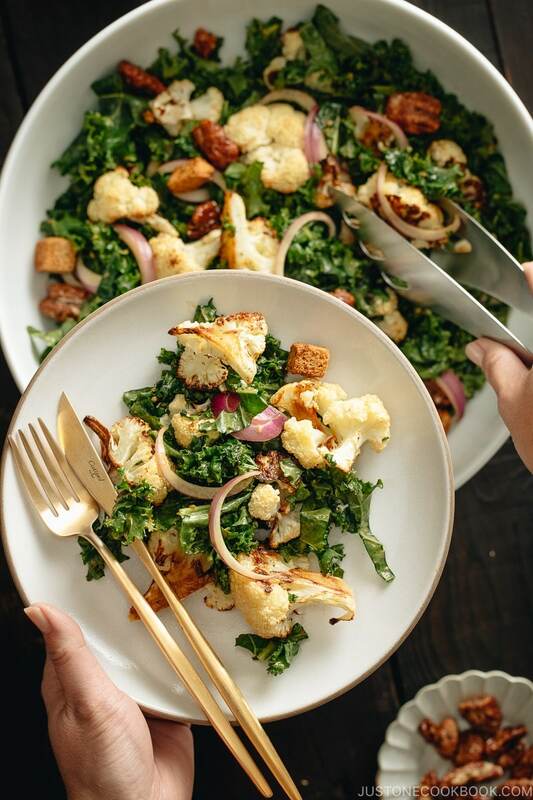 If you’re making the Roasted Cauliflower Kale Salad, I definitely advise making double quantities and taking to work for a healthy lunch the following day. I used Hikari Miso® Organic Miso – Red Miso for the dressing. It is made of 100% USDA Certified Organic rice and soybeans and is additive-free. It has a dark brown color original to Shinshu-style miso. A high volume of rice koji produces its mild taste and smooth texture. 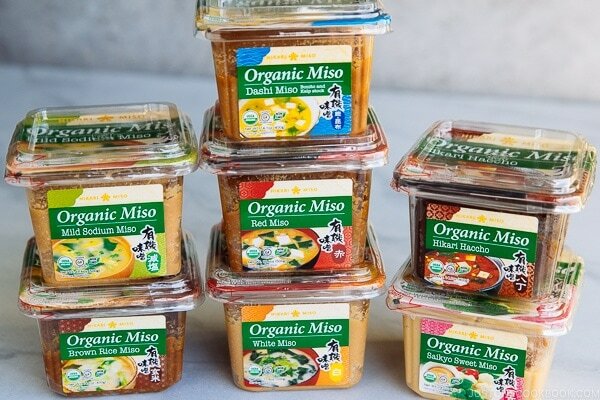 If you’re interested to try it out, you can purchase Hikari Miso® organic miso from most of the Japanese/Asian grocery stores or on Amazon. 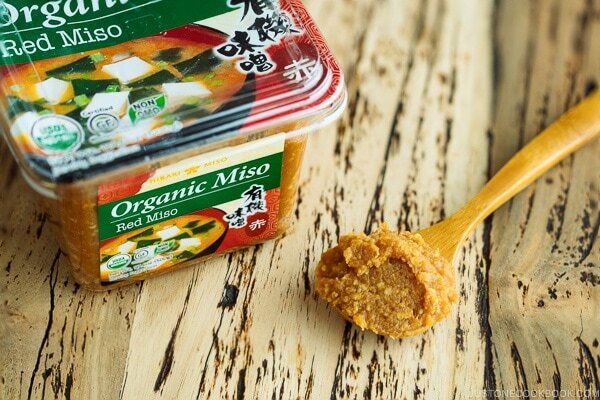 Hikari Miso® is my favorite brand of miso paste and I’ve been using for over a decade. There is also a variety of miso, each with a different flavor you can use for various purposes. When you make All-Purpose Miso Sauce, you can choose any type of miso you like. Each miso has its own unique flavors that you can experiment and enjoy. Gather all the ingredients. Preheat the oven to 450 ºF. Discard the core and cut into smaller, bite-size florets. Rinse the cauliflower and drain well. Put it on a rimmed baking sheet. Drizzle olive oil all over the florets. Season with kosher salt and freshly ground black pepper and toss to combine with hands. Make sure each floret is coated with thin layer of oil (your hands get messy, but it makes great roasted cauliflower). Roast in the oven for 17-20 minutes, or until edges are nicely caramelized and golden brown. Remove from the oven and set aside to cool. 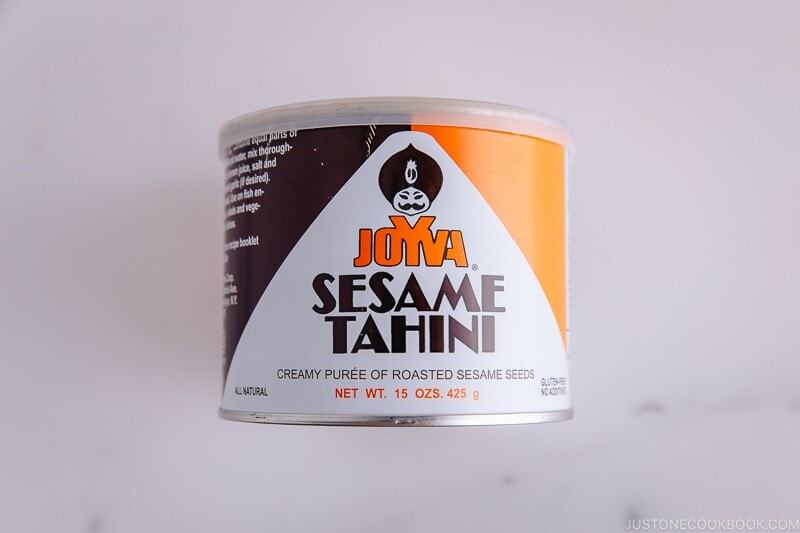 Mix tahini sauce really well before using. 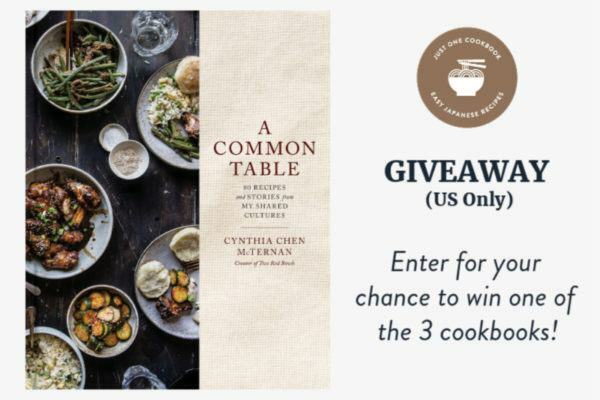 Combine 2 Tbsp Tahini Sauce, 4 Tbsp All-Purpose Miso Sauce, and 3 Tbsp rice vinegar in a small bowl or mason jar. 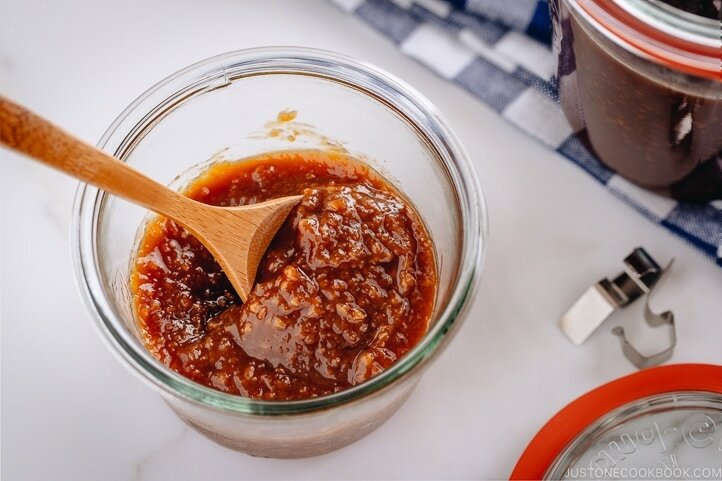 All-Purpose Miso Sauce is sweetened. If you use regular miso instead, taste the dressing, and adjust the sweetness by adding sugar/honey to your liking. Each brand/type of miso has different saltiness and flavor. Make sure to taste your dressing (it should taste a bit stronger before combining with salad). Whisk to combine or shake well. You can keep this dressing for up to a week in the refrigerator. Grip the bottom of the stem with one hand and use the other hand to rip the leaves away from you, like this (Or, of course, you can use a knife to remove the leaf from stem). Tip: Sturdy kale stems can be chopped up and added to stir-fries. 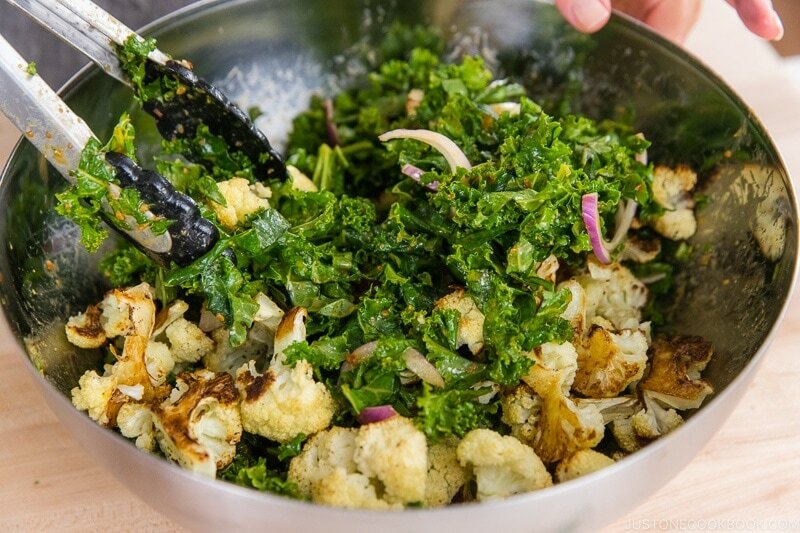 Rinse in a colander, drain well, and chop the kale into smaller pieces (Rinse before chopping so all the good vitamins won't drain from kale). 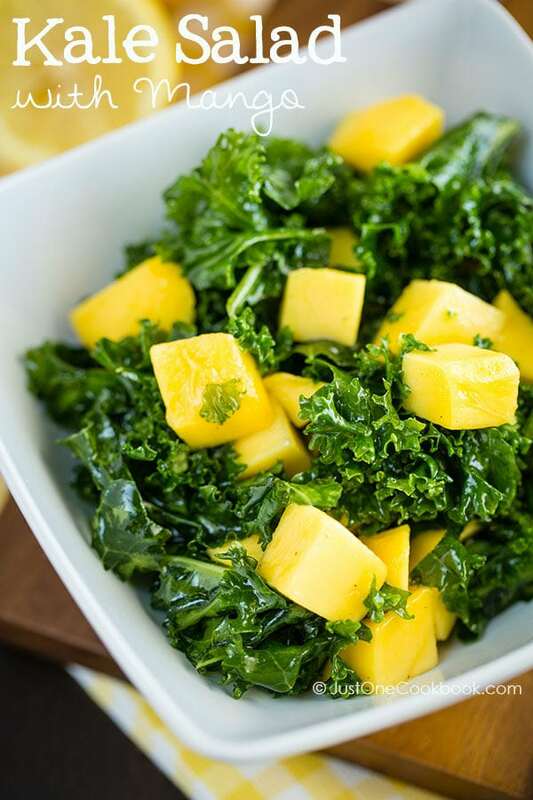 Add the chopped kale and dressing in a bowl and toss to mix. Make sure that kale is well coated with dressing at this stage. Once you add cauliflower, you don't want to break them into smaller pieces. Add the thinly sliced red onion and roasted cauliflower. Gently toss one more time and serve at room temperature or chilled. Sprinkle glazed pecans and croutons. 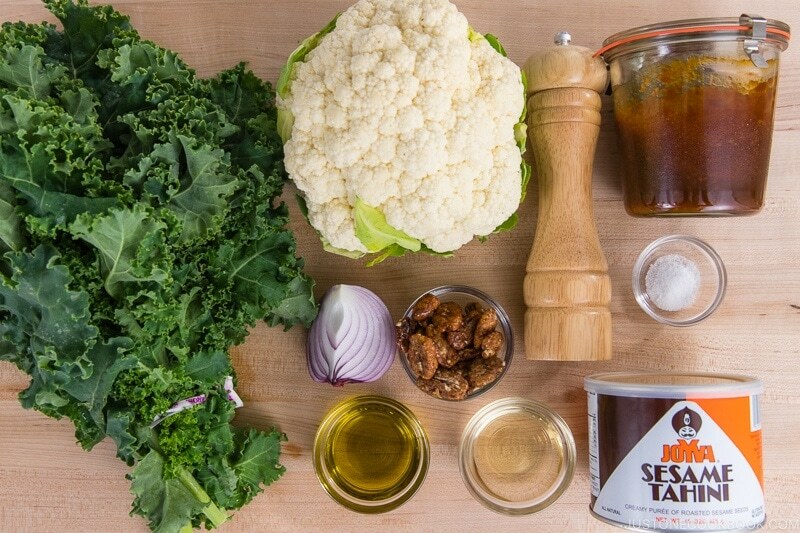 Just made the “ROASTED CAULIFLOWER KALE SALAD WITH MISO TAHINI DRESSING” tonight it was amazing. The recipe looks great. I would like to try it from a printed copy, but can’t find the “PRINT” button. Hi Lorraine! Thank you! The “Print” button is inside the recipe card (right below the square image). Sorry it took me a long time to get back to you. You should always massage your kale by hand with a little bit of olive oil to help soften its texture – it makes a HUGE difference!